Broths and stocks have always had a central place in kitchens around the world owing to their ability to comfort, nourish, and heal. 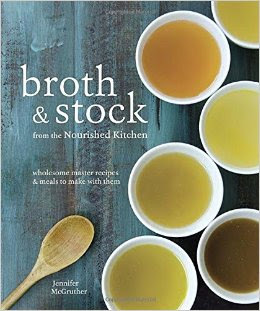 In Broth and Stock from the Nourished Kitchen, Jennifer McGruther, author of The Nourished Kitchen and an authority in the traditional foods movement, illustrates why a good broth or stock is the foundation of amazing and wholesome cooking. Included are over a dozen master recipes for base stocks and then 40 recipes using these stocks in complete meals. These accessible recipes are appropriate for vegetarians, pescatarians, and meat eaters alike and showcase the nutrient-dense, real food that nourishes the body and soul. The Whole Chicken Broth is the perfect base for Springtime Risotto with Asparagus, Green Garlic, and Chive Blossoms, while the recipe for Fish Stock will bring new life to a classic dish like New England Clam Chowder. People are catching on to this centuries old appreciation of bone and vegetable based broths, and Jennifer McGruther shows how these can be made quickly and cost-effectively at home. If you've been reading my blog posts for awhile now, it's no surprise that I LOVE cookbooks. I love collecting cookbooks of all types, and from different cultures. My dream is to open my own restaurant one day, so it's only natural that I love food and cookbooks. My newest book is "Broth and Stock from the Nourished Kitchen". While I was looking through this book, the first thing I noticed that it was very well thought out with the step-by-step instructions. The pictures are amazing and the recipes sound amazing. I cannot wait to try them out. I definitely recommend this book for every kitchen. I even have a copy of this book that I will be giving away soon, so stay tuned for the giveaway post!